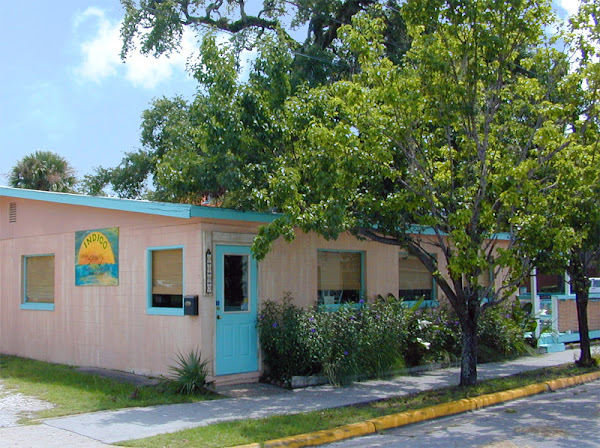 While wondering down the somewhat abandoned streets of Brunswick GA on day two of our Christmas break excursion we stumbled upon this tiny restaurant called Indigo Coastal Shanty. While I must admit, it doesn't look like much from the outside, their unique menu got me intrigued. The menu is a mix of fresh, Mediterranean inspired flavors featuring mostly seafood items and they are also vegetarian and vegan friendly. I had a difficult time deciding on what to order but I finally decided on the black bean burger (those of you who know me know that I am a veggie burger connoisseur of sorts). This burger was house made and topped with fresh spring greens, a swirl of goat cheese (which I subbed out for pepper jack) caramelized onions, red pepper coulis and ...*dun dun dun a FRIED GREEN TOMATO! Never in my life have I seen a more unique and thoughtfully created veggie burger. Behold it's glory! This was, no joke, probably one of the best veggie burgers I have ever had! The bread was slightly toasted, the burger was moist and full of flavor, the tomato was crispy and the tart flavor worked well with the sweet undertone of the red pepper coulis. My dad's fish tostadas were out of this world! Crisp blue corm tortillas, topped with black beans, "Isla" slaw, lightly Jerked fish & pineapple salsa; served with black beans & brown rice. My mom ordered the "Fisherman's Bowl" which was a sauté of fresh catch & local shrimp in a flavorful broth with fennel & tomatoes over couscous with crumble of feta cheese. This meal (which was more like a stew) was the ultimate comfort food. The broth was rich and flavorful and the seafood was melt-in-your-mouth tender. Lewis ordered the Chile rellenos stuffed with a vibrant pork picadillo, roasted and topped with melting Mexican cheese and guajillo ranchera. While I was only able to taste a bite of pepper and cheese, that was enough to confirm the greatness of this meal as well! The slaw was also very unique in that instead of sloppy ole mayo they dressed it in a oil, sesame based dressing. If you happen to be near the Bruneswick GA area you must, I repeat, you MUST stop by and enjoy a meal at this Shanty Shack. The service is friendly, the food is fresh and the town could really use some tourists!